A new pair of gates added on the historic vista from King Henry's Mound to St Paul's Cathedral will open for the first time on Friday 01 June in Richmond Park, marking the Cathedralâs tercentenary. 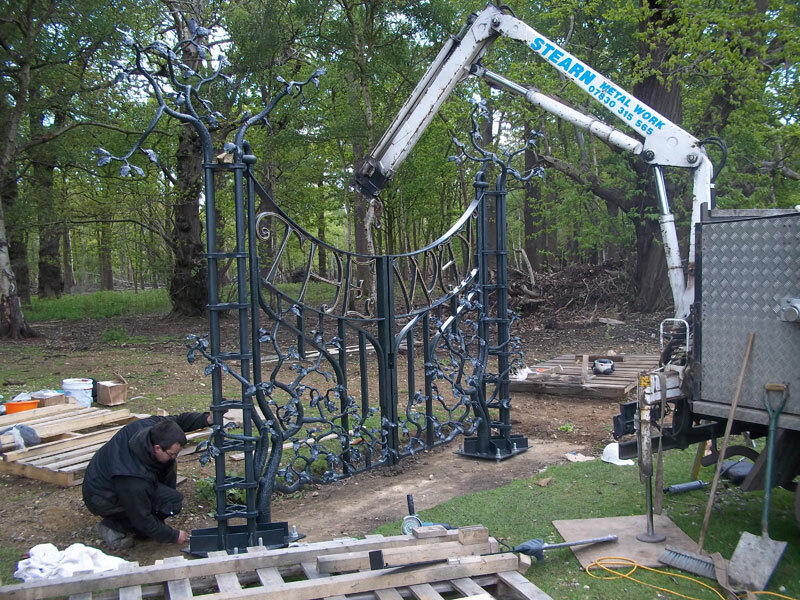 The gates were designed by artist blacksmith Joshua De Lisle, 21, and previewed by Her Majesty The Queen at Richmond Park's 'Wild London' Diamond Jubilee event. They were one of more than 15 submissions received when The Royal Parks decided to replace the gates on the fence of Sidmouth Woods to mark St Paul's tercentenary. Kindly donated by the family of renowned environmentalist and The Ecologist magazine founder, the late Edward Goldsmith, the gates are called 'The Way'. They depict oak branches with an acknowledgement to Sir Christopher Wren - a small wren sitting low down in the foliage. A robin sings from the opposite branch. An epigraph 'The Way', incorporated into the gates, is evocative of the protected vista which connects the park to St Paul's and is defined by cleared woodland which is a wildlife sanctuary. 'The Way' is also an epitaph to Edward Goldsmith, author of the book by the same name. Joshua's originality is evident in the skilful morphing of the oak branches into a concave top to the gates which suggests a reflection of the Cathedral's dome. Joshua was just 19 when his design was chosen by the Richmond Park Manager, The Goldsmith Family, a team of blacksmiths, a structural engineer, Richmond Park supporters and other The Royal Parks staff. The green semi-gloss provides a spectacular finish to the gates whose bark texture has been created to promote algae and lichen growth low down on the gates. This will soften the metal work and blend with the natural environment of this Royal Park which is a National Nature Reserve and London's largest Site of Special Scientific Interest, attracting 4 million visitors a year. Joshua De Lisle graduated in 2009 from the National School of Blacksmiths at Holme Lacy College of Rural Crafts. In his first year he won an outstanding achievement award, the Harry Skinner Best Smith trophy and the live forging competition at the Three Counties Show. He went on to become National Reserve Blacksmithing Champion in 2010 and the St Paul's Cathedral tercentenary gates are Joshua's first public work commission. "The first time you see St Paul's Cathedral from King Henry's Mound, the view takes your breath away. It is magical. "These beautiful new gates, which demonstrate Joshua's exceptional talent, are a fantastic frame for this majestic vista and a fitting way to mark the tercentenary of St Paul's Cathedral. They will be appreciated by visitors viewing St Paul's through the telescope at King Henry's Mound and by walkers around Sidmouth Woods. "The Royal Parks and the Royal Parks Foundation would like to thank our supporters and The Goldsmith Family for making this unique commemoration possible." The gift was made through the Royal Parks Foundation, the charity for London's eight Royal Parks. "Generous gifts like this make a real difference to the life of the parks and are a great encouragement to others who may also wish to play a part in their future." "It is a huge honour to have my first public work on display in Richmond Park to mark the tercentenary of St Paul's Cathedral. "The gates were an exciting challenge and their unveiling will be a proud day." The Royal Parks Foundation is the charity for London's eight Royal Parks. It raises funds and awareness to help conserve and enhance the Parks for everyone to enjoy, now and in the future.